Well, wrong actually. An either/or debate with performance on one side and close reading of the text on the other is completely pointless. Plays are meant to be studied and performed. 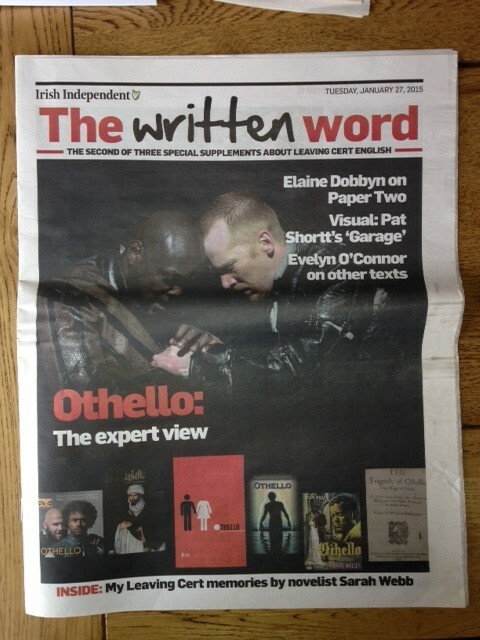 Let’s imagine a bunch of actors are preparing to put on a performance of Othello. They will both study the play and perform the play and crucially, they could not perform it well without studying it closely. For this reason, in rehearsal, they will treat the play script like their bible. Othello, Iago and Desdemona’s motivations [perhaps a quest for respect, revenge and freedom respectively?] and state of mind. how the beginning grabs the audience [Iago’s secret scheme]; where the most compelling moments of drama occur [the temptation scene]; the dramatic climax [Othello murders Desdemona]; and the impact of the ending [horror, shock, disgust…]. the impact of the dramatic and literary devices used. [For example, Iago’s soliloquies make us feel complicit in his crimes; foreshadowing is created through recurring imagery, particularly jealousy as a monster; the symbolism of the handkerchief as a sign of loyalty and the foreboding we feel as this symbol comes to represent ‘proof’ of Desdemona’s betrayal; and dramatic irony drips from every page as the gulf between appearance and reality gets wider and wider and wider, all thanks to Iago’s machiavellian scheme]. We tend to think that these features come to life more fully embodied in the flesh, rather than read on a page, and so they do, for an audience. But the actors job works in both directions, moving from the page to the stage and back again; engaging in a constant interplay between the two until what is on the page becomes so fully a part of the performer that he no longer needs to script. Will actors look at other performances of the play as they prepare? Perhaps, but always in a comparative way. 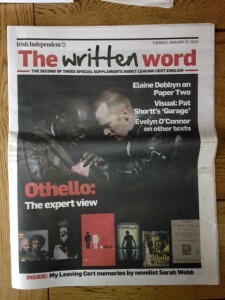 There is no ‘correct’ interpretation of Othello. Examining the differences in the interpretations various actors have taken might help, but an actor won’t copy and paste a performance. They wouldn’t get much praise or admiration for a ‘karaoke’ version; an actor needs to put their own stamp on the character! The truth is, you are expected to be all three! You’ll need to think like an actor, constantly interrogating the play script to figure out all of the same things as the actor listed above – characters, themes, setting, plot, dramatic devices etc. The complicating factor is that you need to do this for all of the characters, not just one, so perhaps your role is closer to that of director than actor. You’ll also need to think like an audience member. Your experience of watching a play undoubtedly matters and the emotions you feel should not be ignored or discarded or dismissed. In fact, one of the most common examination questions on the Shakespearean play asks you to trace your fluctuating levels of sympathy for the central characters, so tune in to your human visceral response as the play unfolds. And finally, you need to think like a critic. How well put together is this play? What devices are used and how do they impact on the audience? What ‘version’ of each character is being presented to you in each performance you watch? This is all very abstract so let’s try and make it real. Imagine you’re an actor playing the role of Iago. Will you play Iago as a vindictive twisted little man who’s throwing all the toys out of the pram because he didn’t get what he wanted (promotion and the social status that goes along with it)? If that’s the version of him that makes the most sense to you, you’ll create a performance akin to Rowan Atkinson in Blackadder. Sneaky, sly, manipulative and ultimately dislikable. But if you take Iago more seriously and see him as a dangerous sociopath, utterly devoid of conscience, then your version of Iago will more closely resemble Tom Vaughan Lawlor as Nidge in Love/Hate. A remorseless, ruthless, single-minded psycho with an indefinable charm. The kind of person who will smile in your face even as he stabs you in the back. These two versions will in turn have very different impacts on the audience. We’ll be amused by the Blackadder-esque Iago but we’ll also view him as somewhat pathetic. His vindictiveness will disgust us and we’ll want him to get caught. But if we’re viewing a Nidge-esque portrayal of Iago, we’ll be constantly on the edge of our seats, terrified by yet weirdly drawn to this magnetic psycho. We’ll know he deserves to get caught but we’ll feel conflicted about whether or not we want that to happen. What is it about the way Shakespeare has written the part of Iago that makes us wonder why the play’s not named after him? He is not the eponymous hero of the title and yet, without Iago, there is no play. How does he drive forward the plot? What language and imagery emerges from his mouth? How does the irony at the centre of the play hinge almost entirely on his contradictory words and actions? How does his behaviour at the end effect the atmosphere in the theatre as the play ends and the curtain comes down? So should you study the play or see it performed? The answer is not either or, but both!